Acupuncture is one of the most ancient of the healing arts and has been widely used as part of traditional medicine in East Asia for over 2500 years. Therapeutic insertion of solid needles in various combinations and patterns is the foundation of the practice. With scientific advances, including the use of PET scanning and functional MRI scanning, the physiologic mechanism by which acupuncture works is being revealed. What to Expect at the Acupuncture Visit: Patients are evaluated during the consultation visit with treatment recommendations made at that time. If you are a candidate for acupuncture treatment, a treatment session will be included in the session. Expect to complete a medical and personal history form prior the consultation. Please allow 1-1/2 hours for the initial evaluation/treatment. Follow-up treatments usually last 45 minutes to 1 hour. Does insurance cover acupuncture? Carly Kirby is a preferred provider with most major insurances, many cover acupuncture, check with your insurance company to see what your plan covers. All HSA’s and Flex plans are accepted. How many visits are needed: Acupuncture treatment usually involves a progression of treatments. Generally a series of 4-8 treatments may be necessary for effective treatment. The more chronic the problem, the longer it may take for an effective treatment. What will I feel during the treatment? Acupuncture needles are placed in specific areas of the body. The needles are very fine and usually do not cause discomfort on insertion, however it is normal to have a ‘heaviness or soreness’ sensation. This is known as de qi. Needles are left in for 10-15 minutes before removing. Occasionally there may be some bruising at the insertion site. How will I feel after the treatment? Many patients will feel very relaxed after a treatment session, while some may feel energized. It is not uncommon to have some mild soreness for 24-48 hours after a session. 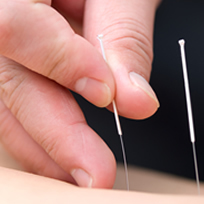 Are there other treatments that may be used in conjunction with acupuncture? Depending upon the condition being treated, electro acupuncture, moxabustion, cupping and medication by injection may be recommended. These procedures will be discussed during the visit. Call 303.772.9660 Today for a $50 ‘Valentines’ Initial Evaluation and Treatment for a total savings up to $100.